Samsung's Galaxy A event in Italy is now behind us, but the best bit is yet to come - our hands-on time with the Galaxy A80, of course! 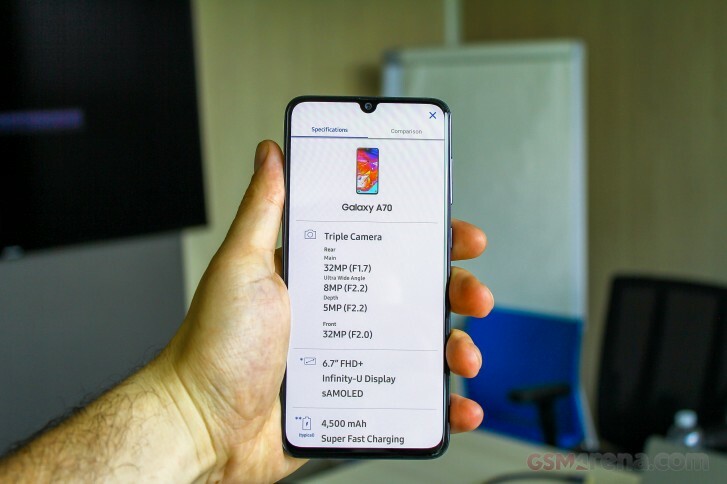 A slider, a swivel triple camera, notch-free bezel-less screen, and more - there are so many things to see in the new Galaxy A80. But if this is too much for you, then you might be interested into the more ordinary Galaxy A70. 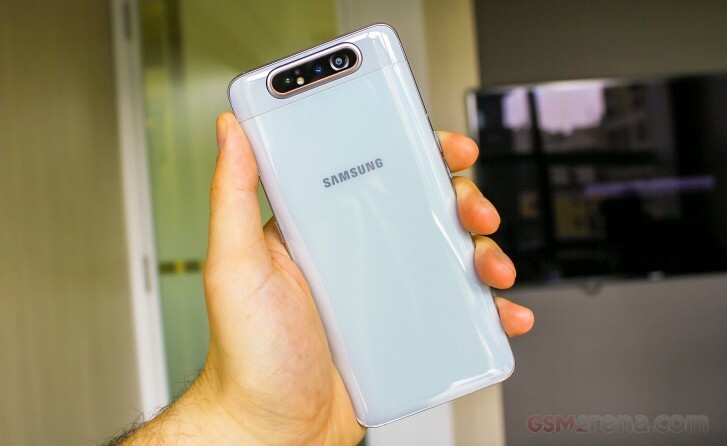 Samsung was one of the few makers to stay away from the screen notch as long as possible and it still is - prioritizing punch-holes before dewdrop notch. So, if anyone had told us a while ago that the company would dive deep into the experimental designs with both slider and a swivel, we would have called it highly improbable. But a few weeks ago, the leaks began hinting what seemed improbable to be very much on the way. And today - the Galaxy A80 was announced in Italy with a large 6.7" AMOLED screen and it's notch-free and as bezel-less as they come. It is a slider just like the Mi Mix 3, but instead of revealing a couple of selfie snappers - the rear triple-camera is on a swivel and rotates automatically to double as a high-end selfie imager. Oppo N1, anyone? The moving camera contains a trending 48MP sensor with f/2.0 lens for regular photos, an 8MP snapper behind f/2.2 12mm ultra-wide-angle lens, and a ToF camera. This is both your main and your selfie camera, meaning you should be getting a high-end experience no matter the occasion. Samsung also showed the Galaxy A70 at the event, which was unveiled officially a few days ago. It's basically the A80 but without a slider - meaning a 6.7" Super AMOLED screen with a notch containing a 32MP selfie camera and a triple non-rotating camera on the back. The A70 is also running on the Snapdragon 675 chip instead of 730. 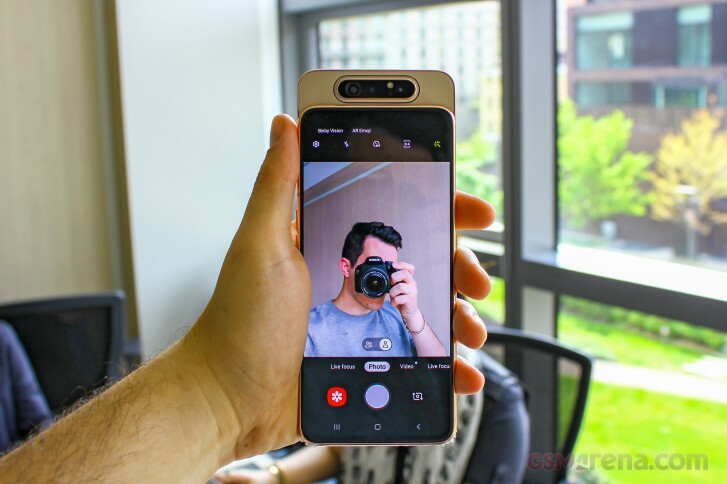 So, we've spent some time with the Galaxy A80 and A70 after the event and our first impressions are in. Check them out on the following pages. Body: 165.2 x 76.5 x 9.3 mm, glass front and back, metal frame. Screen: 6.7" Super AMOLED, 1080x2400px resolution, 393 ppi. Chipset: Snapdragon 730 chipset: octa-core (2x2.2 GHz Kryo 470 Gold & 6x1.7 GHz Kryo 470 Silver); Adreno 618 GPU. Memory: 8GB RAM, 128GB built-in storage. Swivel camera: Primary: 48MP, f/2.0, PDAF; Secondary: 8MP, f/2.2, 12mm ultra-wide, fixed focus; Depth camera: ToF; LED flash; 1080p@30 video recording. Connectivity: Dual-SIM; LTE Cat.12 (600Mbps) download / Cat.6 upload (50Mbps), Wi-Fi a/b/g/n, GPS; Bluetooth 5.0, A2DP, LE, USB-C 2.0. Misc: Under-display fingerprint reader, down-firing loudspeaker. Body: 164.3 x 76.7 x 7.9 mm, glass front and back, metal frame. Chipset: Snapdragon 675 chipset: octa-core (2x2.0 GHz Kryo 460 Gold & 6x1.7 GHz Kryo 460 Silver); Adreno 612 GPU. Main camera: Primary: 32MP, f/1.7, PDAF; Secondary: 8MP, f/2.2, 12mm ultra-wide, fixed focus; Depth camera: 5Mp f/2.2; LED flash; 1080p@30 video recording.